Kevin Thomas, Jr. 3-3 in Sprint Car wins during Midget Week! 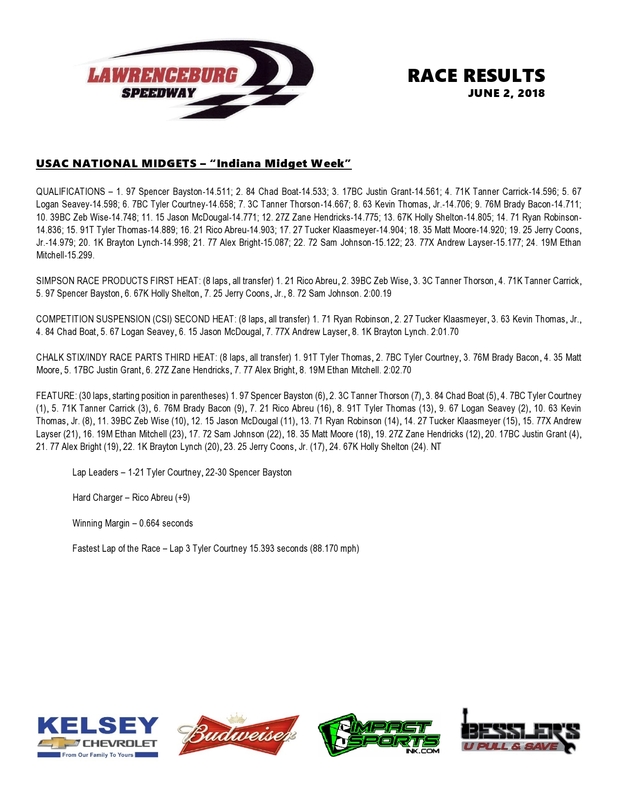 Although, this week in Indiana, ther USAC National Midget Series takes the center stage across the state, one thing has become clear. Kevin Thomas, Jr. has won all 3 sprint car features this week with the last one coming up at Kokomo Speedway. KTJ started on the outside of the front row and led all 25 laps on his way to his 8th career win at Lawrenceburg and first of the year. This win also marks his 8th win in 2018 at 8 different tracks. CJ Leary made a daring run for the lead but jumped the cushion in turn 1 and 2 dropping him back to third where he was unable to mount another challenge. Brady Bacon finished second followed by Leary, Thomas Meseraull, and Jarett Andretti. Heat race winners were Thomas, Jr., Bacon, Dallas Hewitt, and CJ Leary. Clinton Boyles won the B Main. 30 Kelsey Chevrolet Sprint Cars were on hand to compete. The point leader coming into the night, Dickie Gaines failed to make the feature after hitting the restart cone during the B main penalizing him 2 spots in the finishing order. 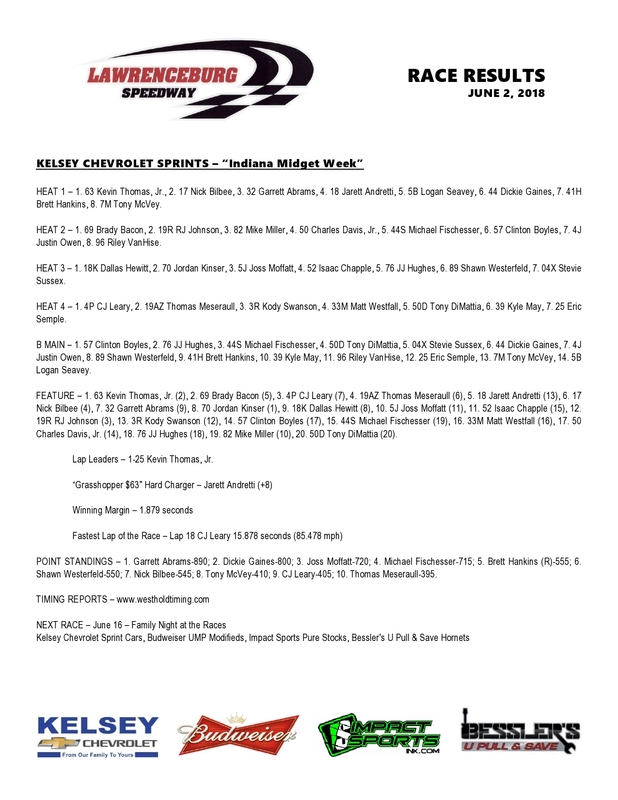 The Kelsey Chevrolet Sprint Cars return to Lawrenceburg on Saturday June 16th. Stricker Holds of Hamilton in Modified Thriller!! Adam Stricker watched from the stands this past Monday as his car, and driver Nick Hoffman won the mod feature. They had asked Nick to drive the car to sort out some of the bugs and issues they had been having. Well Hoffman was able to do that and it looks like the results have paid off. Stricker took the lead away from Brad Wieck on lap 4. He laos had to pass Matt Hamilton in the process. It was a big time move around the outside of Hamilton and for the remainder of the laps, Stricker and Hamilton traded slide job after slide job lap after lap delighting the crowd who cheered lap after lap for the great race they were watching. Both drivers gave each other plenty of racing room and didn’t appear to ever touch each other. In the end, Stricker held off Hamilton widely considered the best modified driver in the area. Following Stricker and Hamilton across the line were Jason Hollon, Brad Weick and Kyle Schornick. Heat race winners were Cole Roberson and Matt Hamilton. 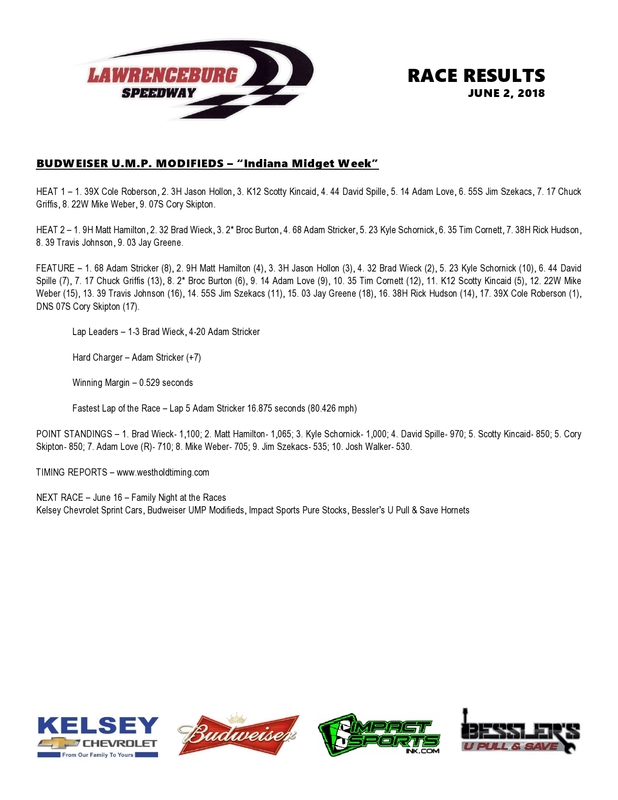 The Budwieser UMP Modifieds return to the track on Saturday June 16th.